The prototype, designated the IK-L1, of the design was ordered from Ikarus A.D. in 1934, and was delivered for test in 1935. The aircraft was powered by a Hispano-Suiza 12Ycrs inline engine. The forward-firing armament consisted of a 20 mm HS-404 cannon mounted under the engine, and two 7.92 mm Darne machine guns, mounted under and to each side of the engine. The design was similar to the Polish PZL P.8, sharing its Pulawski wing (gull-wing) design, giving the pilot an excellent view. The wing on each side was braced with two struts; the fixed conventional landing gear was spatted and mounted off the wing struts. The fixed tailwheel was also spatted. The pilot was installed aft of the wing in an enclosed cockpit. The horizontal stabilizer on each side was braced from below with two rigid braces from the lower tailcone, and tied from above with two flying wires from the vertical stabilizer. The three-bladed propeller was manually adjustable in pitch. Captain Leonid Bajdak, a biplane advocate, tested the IK-1 in flight. During a full range of tests on the third flight the aircraft failed to pull out of a power dive and crashed. Bajdak bailed out and survived but claimed the IK-1 was not suitable as a fighter. Investigation of the wreckage disclosed that the failure was due to negligence in sewing a seam on one of the fabric-covered wings, and therefore a decision was made to proceed with the second prototype, designated IK-2. The second prototype had metal-skinned wings and a shallower cooling radiator. The IK-2 was ready for test in June 1936. A new test pilot, Dobnikar, performed the preliminary flight tests, including a mock battle against a Hawker Fury, a biplane, flown by Captain Bajdak. The IK-2 outperformed the biplane in all respects, thereby confirming the hopes of the young designers. 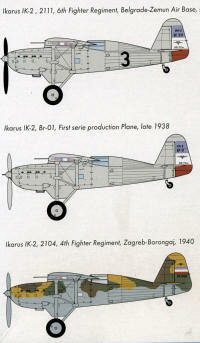 Based upon results of preliminary testing, the Royal Yugoslav Air Force ordered a production batch of 12 IK-2 fighters, which were all delivered in 1937. 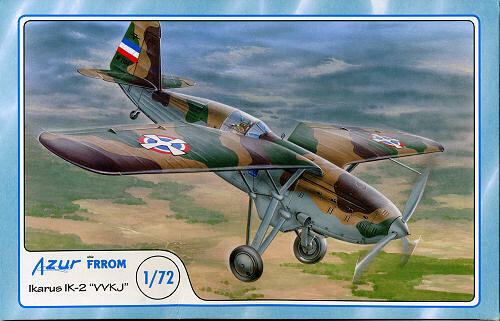 When German forces invaded Yugoslavia on 6 April 1941, the only unit of the Yugoslav Air Force armed with the IK-2 was the 4th fighter regiment, composed of 33rd and 34th air force groups stationed at Bosanski Aleksandrovac airfield, in northwest Bosnia. The 4th fighter regiment was equipped with 18 Hawker Hurricanes and eight Ikarus IK-2 fighter aircraft. Rovine airfield, situated north of Banja Luka, was the base of the Yugoslav 8th bomber regiment and its 24 Bristol Blenheim I bombers. During a German attack on the base on 7 April, five IK-2s together with five Hawker Hurricanes engaged German Messerschmitt 109 fighter aircraft. In the ensuing dogfight, the Yugoslav fighters managed to repel the 27 attacking German fighters, destroying two in the process at the cost of two Hurricanes and one IK-2. For the rest of the short conflict IK-2s were used for strafing advancing German columns and on several occasions they scrambled in pursuit of German reconnaissance aircraft, but to no effect. At the end of the brief campaign the four surviving IK-2s were overhauled at the Ikarus aircraft plant in Zemun before being transferred by the Germans to the newly formed Air Force of the Independent State of Croatia. Along with AZ Models a nd a few others, Azur/MPM has been producing some rather interesting central European aircraft under the Azur/FRROM label. This one is a pre-war Jugoslav fighter that one rarely finds in kit form in any scale. It is a typical new mold MPM brand kit with very nice external detailing and some ejector towers to remove on the large bits. 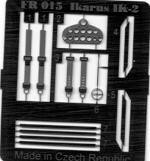 Due to the lack of complexity of the design, there are no resin parts and photo etch has been kept to a minimum. This latter consists basically of an instrument panel, seat harness and some external struts for the tail plane and one pair for the main wing struts. As mentioned, the kit is simplicity in itself with a cockpit that has the basics; seat, stick and instrument panel. The wing struts and landing gear may look daunting, but should not be an obstacle to most builders. The kit provides both injected and vacuformed canopies for the builder. There is minimal rigging required for the wing str uts and for the horizontal stabilizer. Instructions are well done with the usual Gunze paint references. A rigging guide is provided and the build steps include reference drawings to be sure all gets aligned properly. There are seven markings options. Five of them are overall aluminum aircraft with the 6th Fighter Regiment in late 1939. The other two are with the 4th Fighter Regiment in 1940 in the then standard camouflage. These last two options differ in insignia size and placement. 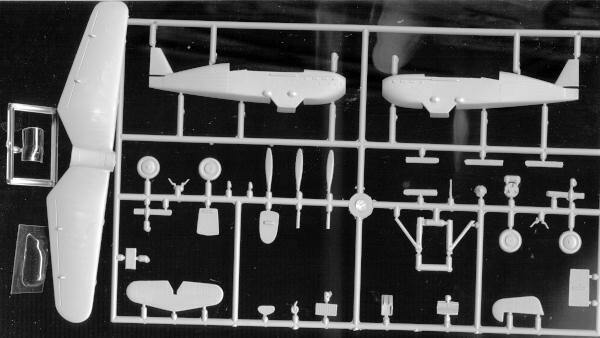 The decal sheet is very nicely done and will probably require some care in applying thanks to their thinness. If the box art colors can be believed, the blues look to be too light. A very nice kit of a relatively unknown aircraft that had little impact on the war. For those like myself who have a fondness for parasol wing or gull wing fighters, this is a kit that you should seek to add to your display shelves.